Wrap conversion baby carriers are made up on a waiting list system which can be up to several months long so please contact me to book a slot at the earliest possible convenience. Once I have booked you onto the list, I will send you an order form for all the design details. I will then contact you again approximately 1 month before your slot is due to request the wrap and finalise any details. Please note that the "Minimum wrap length" that is stated for each carrier is just a guide. A longer wrap may well be required for carriers with sleep hoods, other optional extras, or for wraps with specific patterns that require pattern matching. Please confirm with me what size wrap you will need after you have chosen all your options. Please see our DESIGN FEATURES page for help with choosing your options. Please see or Wrap Conversions Gallery page for examples of previous work. If you can't wait for your own Wrap conversion, I have Ready-to-buy wrap conversions made from the gorgeous Honeycomb Loom wrap fabric. These are available via the main SHOP page. ​Occasionally I will stock ready-made wrap conversions from other wraps. These are also available on the main SHOP page. 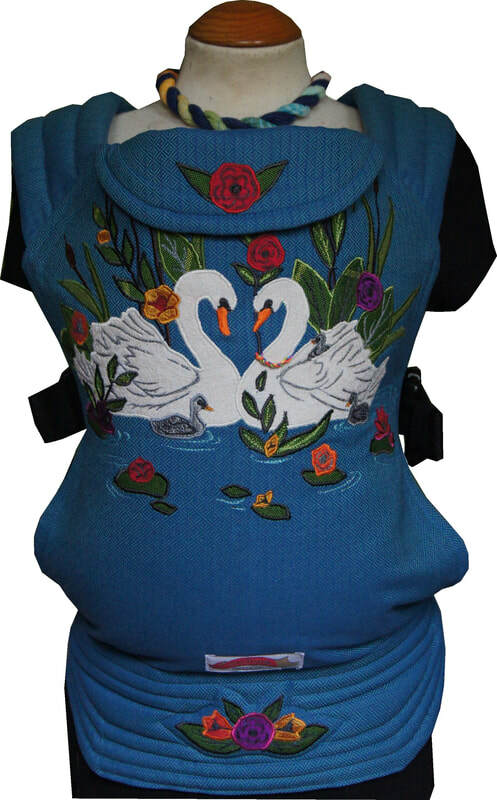 Carriers are available in several sizes. If the carrier has a waistband,the height is measured from the top of the waistband (so does not include the waistband measurement), to the flat top edge of the carrier (so does not include the rounded headrest). The width is measured at the level of the leg padding, about 1.5" above the waistband. Width cinchers and Height cinchers can be added to all carriers (except Podaegis). These will reduce the dimensions by a couple of inches so that you can be sure to get a perfect fit. - If you are sending a brand new wrap, please wash it at least once to avoid future shrikage of the fabric. If you are sending a used wrap, please ensure that it is clean. If I need to wash a wrap before starting work on it, I will charge a £5 laundering fee. - I will automatically return any wrap scraps above a few inches in size. If you either have no need for your scraps and are happy for me to keep them for future applique work or, alternatively, you would prefer me to return every snippet, please let me know. - All Wrap Conversions will be returned by Royal Mail Special Delivery and charged at cost (currently between £8.45 - £11. Subject to change). ​(an integrated cord across the width of the seat that cinches the seat area a couple of inches narrower). These are Kam-snap closing pads that wrap around the shoulder straps where they attach to the body of the carrier. They have an inner layer of terry towelling and act as a protector for your carrier. They are recommended if you have a baby who is still at the sucking/teething stage. - wrap strap style waist ties custom lengths available. ( these will allow you to cinch the waistband in by a couple of inches). - 1.5m wrap style straps (custom length straps available on request). - Inbetween size: 17" x 22"
(These are half the width of the wrap and come in 4 lengths depending on how you want to finish the tie-off. Please be sure to choose the correct length for your body size and for how you want to finish the tying off). ​- SHORT - 1m long - enough for a basic tie - (roughly equivalent to wrapping with a Size 2 wrap). These straps will hang down the front of your chest and make the carrier fold down very small. ​- MEDIUM - 1.5m long - enough to tie off under baby's bum - (roughly equivalent to wrapping with a Size 4 wrap).) For average sized users this is the optimum choice. - LONG - 2m long - enough for average wearers to pass over baby's bum and bring back up to the front for a chest pass, or for larger wearers - (roughly equivalent to wrapping with a Size 6 wrap). - EXTRA LONG - 2.25m long - This length allows the most flexibility in wrapping the ties, and the fanciest of tie offs across the chest, or for larger wearers - (roughly equivalent to wrapping with a Size 7 wrap). (Please note: The upper part of the pod will be made from two layers of wrap. The blanket part can be made from a single or double layer of wrap). Podaegis can be made with either straight straps that exit the body panel from the side creating a continuous top edge, or with angled straps that exit the body panel at an angle such as you would find on a Mei Tai. (these straps exit the body panel horizontally, level with the top edge). Would you like to make your carrier truly unique with some beautiful, personalised artwork? I specialise in applique and free-motion embroidery (also known as thread painting) and am happy to discuss design ideas with you. All artwork is done by hand and the thread painting is hand-steered (no computerised patterns here!). - Applique is charged at £10 per hour of sewing, plus £10 for designing, drawing up the templates, bondaweb, stabiliser, fabric and threads. 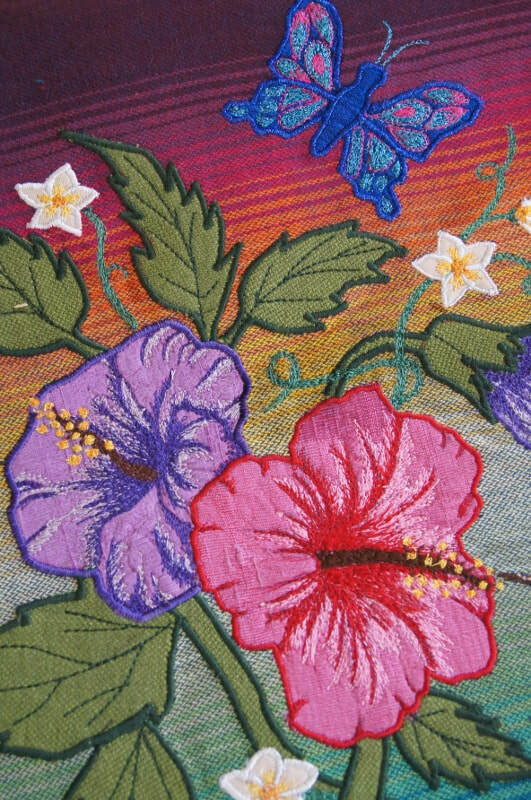 - Artwork may be entirely in applique; entirely in free-motion embroidery or a combination of both. 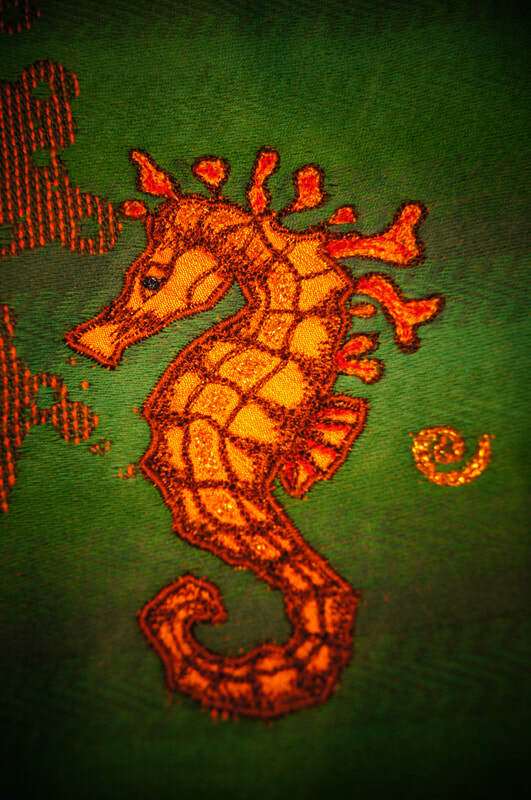 I may use either wrap scraps, quilting cottons or silk dupion for any applique. 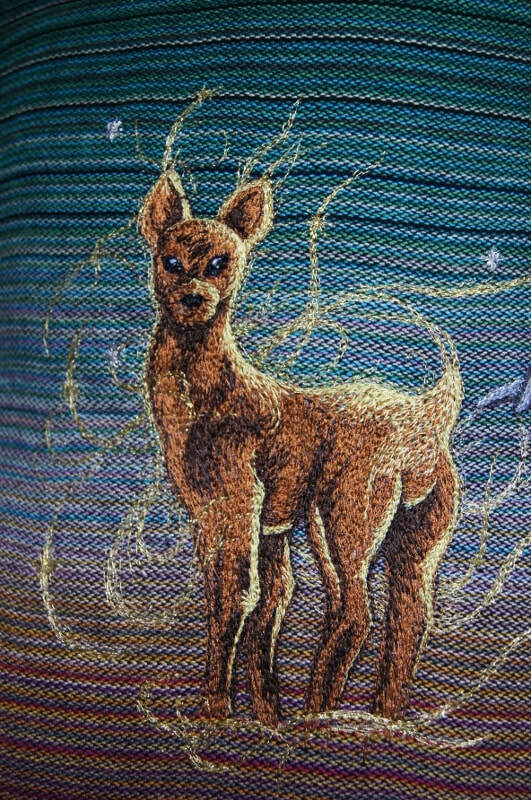 - Embroidery is done with my usual Gutterman sewing threads or Gutterman Sulky, and highlights may be added with metallic or holographic threads. ​- Rough estimates are anything from £10 - £15 for small hood decoration and £10 - £150 for body decoration. Prices will vary according to the complexity of the design and small motifs may be charged individually rather than by the hour. - If you know what you want, please send me a sketch, or email me an image. If you cannot give me exact dimensions, please accept that there will be a certain amount of "artistic licence" at my end and you may not get exactly what you picture in your own mind! You may supply your own decorative fabric for a full body panel or a decorative stripe. You can either send the extra fabric with your Wrap or order it and put my address as the Delivery Address. Please consult with me first to discuss suitability of the fabric and quantity needed. If you would like help sourcing your fabric, please contact me for a list of suitable websites.